It is now easier for Californians to quickly search for contributions to candidates and ballot measures and contributions from individuals, businesses and other campaign committees. 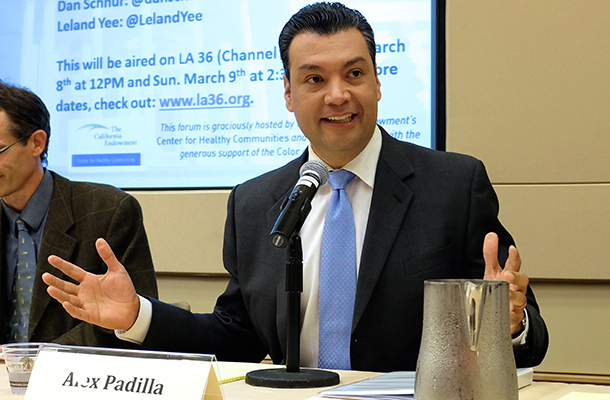 California Secretary of State Alex Padilla today launched Power Search a new open source campaign finance search engine available on the Secretary of State’s website. Power Search was developed in a partnership between the Secretary of State’s office and MapLight— a nonprofit, nonpartisan research organization that tracks money’s influence on politics. The new tool allows anyone to swiftly and easily review the source, recipient and amount of state level campaign contributions. It also provides summaries of information at the contributor, candidate, ballot measure and campaign committee levels. The new Power Search tool makes it easier to search campaign finance data that is refreshed daily from the state’s existing CAL-ACCESS system. The project’s development was funded with a grant from the James Irvine Foundation with the goal of providing Californians with access to information critical to democracy. CA Fwd’s Ung amplified on the theme of continuing the work to make information more accessible and modernizing California’s aging campaign finance and lobbying disclosure system. “CA Fwd joined with our allies to create the Cal-Access Working Group to ensure the transparency system is modernized the 21st century voters. The new search tool is a step in the right direction and we look forward to continuing our work with Secretary Padilla on future innovations,” said Ung. The Working Group’s goal is to modernize the system to meet 21st century standards including instantaneous access to raw data, modern disclosure and visualizations, streamlined forms, predictable and timely filing schedules, and highlights of high value information voters need to make informed choices in the ballot box. The Power Search tool features are a good start towards the accessibility goal. With a few clicks, anyone can identify contributions made by corporations, organizations, or individuals from 2001 to the present. Search results can be filtered by recipient, date, amount, location, as well as other criteria, or they can be downloaded into a spreadsheet for further analysis.